Dave Friedman is the man behind some of the most impressive tones in rock 'n' roll, and has been for over 25 years. Throughout that time, luminary players such as Jerry Cantrell and Steve Stevens have been relying on Friedman's amplifier modifications, repairs, and builds to keep them sounding at the top of their game. With that expertise in tow, Friedman moved into crafting his own line of top-shelf electric guitar amplifiers, instruments, and effects, and in doing so has built one of the most enviable rosters of artists out there. Whether discussing the plexi-on-steroids tone of the BE-100, the pedal-platform versatility of the Buxom Beauty, or the fire-breathing Bill Kelliher signature Butterslax head, Friedman amps are undoubtedly taking over as the premier rock 'n' roll electric guitar amplifiers. A centerpiece of the Friedman Amplification lineup, the Dirty Shirley effortlessly blends the old-school rock tones of late '60s England with the focused and clear high-gain tones that define the Friedman Empire. This single-channel tube amp sets the standard for touch sensitivity, cleaning up beautifully as you lighten up your pick attack or roll back your guitar's volume. It is also an incredible platform for your whole array of stomp boxes. Though it excels at classic rock crunch, the Dirty Shirley is also commonly run much cleaner and can also conjure enough grit to hold its own with old-school metal. The Friedman Dirty Shirley may be the ultimate rock 'n' roll example of "less is more." If you're a modern-style player who demands a classic rock tone, dripping with juicy harmonics, you'll want to plug into the Synergy Friedman DS preamp. While some preamps seek to emulate or model a particular amplifier's tone, the DS has been carefully designed by none other than Dave Friedman to nail the exact tone and feel of his Dirty Shirley amps. 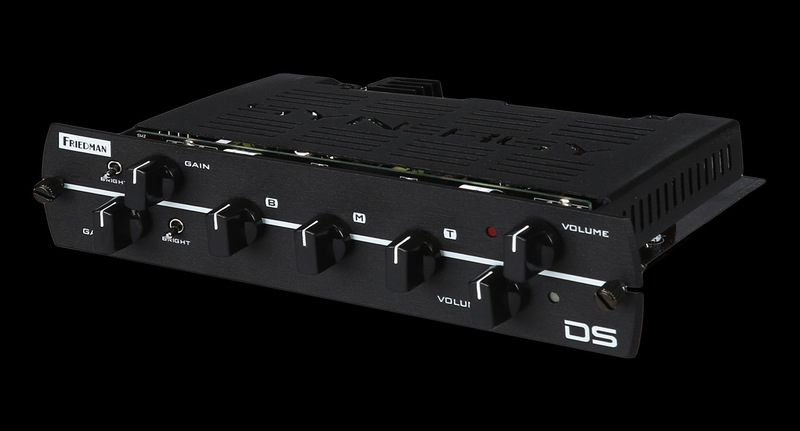 In fact, the DS module's two 12AX7-powered channels offer even more versatility than Friedman's original tube head. Dial one channel in with a bit of grit while the other is driven into a luscious lead tone, and it's like having two Dirty Shirleys at your beck and call. Install the Synergy Friedman DS Preamp and dive into Dave Friedman's take on the ideal vintage guitar tone. 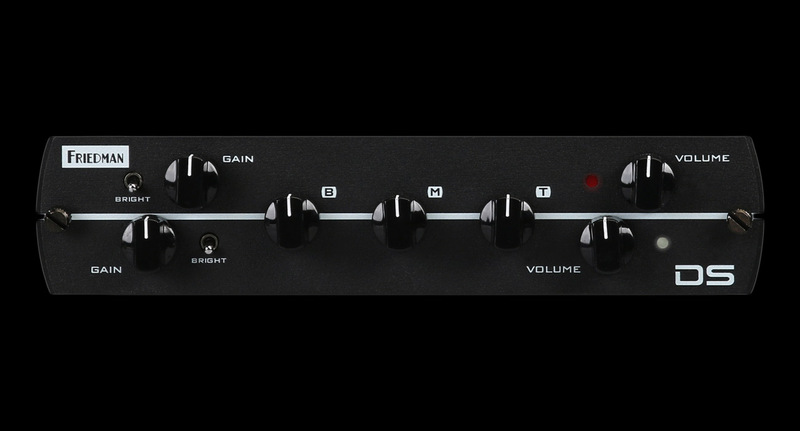 The Synergy DS pre-amp features two channels each with knobs for gain and volume and a bright switch. Both channels share a three band EQ. 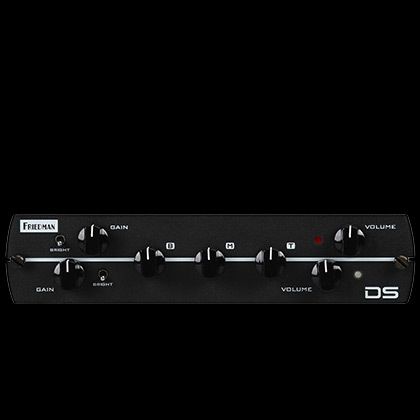 The Friedman DS module includes a three position switch which allows you to configure the input tube bass response to match the original circuit of the selected module Patent Pending. Switch setting will will affect the feel and tightness. Each amp designer has a specific combination of components that makes up their input tube circuit. We have selected the three most popular combinations which you can access with this switch. You can experiment and try any of the positions to see what you prefer. The Friedman DS module will come preset to Dave Friedman's preferred setting which is switch position 2 (2.7K resistor and .68uf capacitor).